This is the only authenticated photo of President Lincoln at Gettysburg. 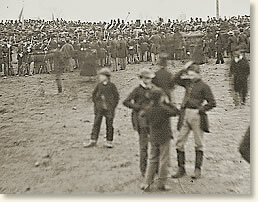 It was taken about noon on November 19th, 1863, some 3 hours before the President spoke. When the event was over, the newspapers here in America pronounced the President's remarks as "lackluster" and "barren." Instead they concentrated on the more than 2 hour speech which preceeded the President's remarks, and was given by Edward Everett, who was considered to be the greatest orator of his time. Nobody remembers what he said. The crowd measured from fifteen to twenty thousand that day. The President had arrived the night before and was accompanied by a crowd on his way to the Cemetery. Mr. Everett spoke first, after an opening prayer. After he was through, Lincoln rose and spoke for 2 minutes. The crowd seemed almost suprised at the short speech which Mr. Lincoln made. Coming, as it did, upon the heels of Mr. Everett's speech they were almost in a trance, and Lincoln remarked to his aide, John Hay, "It is a flat failure and the people are disappointed." This is the photo of the crowd at the time that Lincoln was making his speech. The photo at the top of the page was enlarged and taken from this photo. 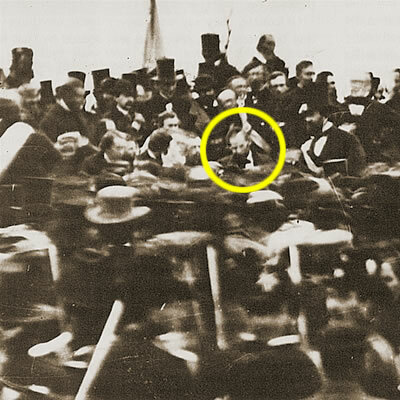 It is the only known photo of the proceedings that day in which the President's presence has been authenticated. The following day, on November 20th, Everett wrote the President to praise the speech, and gradually, as it was printed across the country, it came to be seen for the perfect piece of oration that it was, and still remains today. Place all of the politics of that war aside and really listen to what Mr. Lincoln was saying that day. I don't think these words have ever been surpassed, in either beauty or brevity. It is for us the living, rather, to be dedicated here to the unfinished work which they who fought here have thus far so nobly advanced. It is rather for us to be here, dedicated to the great task remaining before us—that from these honored dead we take increased devotion to that cause for which they gave the last full measure of devotion—that we here highly resolve that these dead shall not have died in vain—that this nation, under God, shall have a new birth of freedom—and that government of the people, by the people, for the people, shall not perish from the earth."